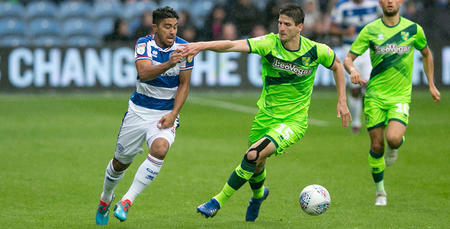 RANGERS came from behind to record a thumping 4-1 victory against Norwich City at Loftus Road. Ryan Manning’s unfortunate own goal handed Daniel Farke’s Canaries a 38th-minute lead. But the R’s responded in fine fashion to complete a resounding Sky Bet Championship success. 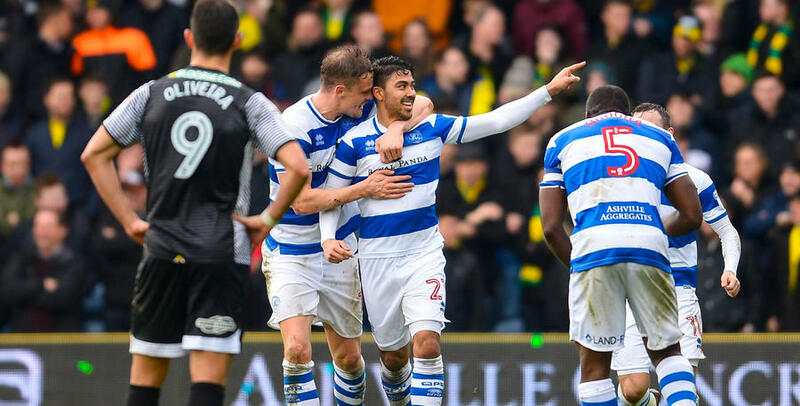 Massimo Luongo’s instant reply in the 39th minute drew QPR level heading into half-time. Matt Smith then headed Rangers into a 2-1 lead, before Ebere Eze and Manning – atoning for his earlier blemish, not that he knew much about it – added gloss to the scoreline with goals in minutes 60 and 80. Hoops boss Ian Holloway made four changes to his QPR team following our narrow Good Friday defeat at Reading. Eze, Luongo, Manning and Smith – all on target in the end for the R’s – were reinstated to Rangers’ starting XI. That meant Jordan Cousins, Paul Smyth, Conor Washington and Pawel Wszolek dropped down to the substitutes’ bench. QPR lined up in a 4-4-1-1 formation: Alex Smithies; Darnell Furlong, Nedum Onuoha (captain), Joel Lynch, Jake Bidwell; Manning, Josh Scowen, Luongo, Luke Freeman; Eze, Smith. On a wet west London afternoon, the inclement conditions weren’t exactly conducive for free-flowing football early on – even though both teams tried to get the ball down and play. Visitors Norwich probably shaded the opening exchanges, certainly in terms of possession. In the 13th minute, Rangers’ Smith had to produce an important block on 12 yards to keep out Nelson Oliveira’s goal-bound effort, after the latter linked well with Canaries star man James Maddison. Looking to take advantage of the slippery surface, QPR’s maiden attempt arrived in the 23rd minute when Lynch let fly from fully 35 yards. But Norwich goalkeeper Angus Gunn stooped to produce a smart low save. Rangers enjoyed more possession as the half progressed. On 27 minutes, another low effort – this time from Freeman inside the box – was again held well by Gunn. And two minutes later, Freeman also volleyed wide from 18 yards. The R’s were edging closer and in the 34th minute, Eze’s left-wing delivery from a short-corner routine resulted in Smith rising to head against the far post. Then a minute later, Eze himself nodded over following Freeman’s lofted centre from the opposite flank. But it was Norwich who would take the lead in rather-fortuitous circumstances, seven minutes before the break. No sooner had a goalmouth scramble ensued in their own box, the Canaries raced away on the counter attack before another melee inside the penalty area resulted in the ball deflecting in off Manning. However, undeterred, Rangers responded in a minute to go in level at half-time. An intricate home move ended with Luongo playing a neat one-two with team-mate Smith, before the former’s impressive toe-poke finish from 10 yards trickled into the bottom left-hand corner. 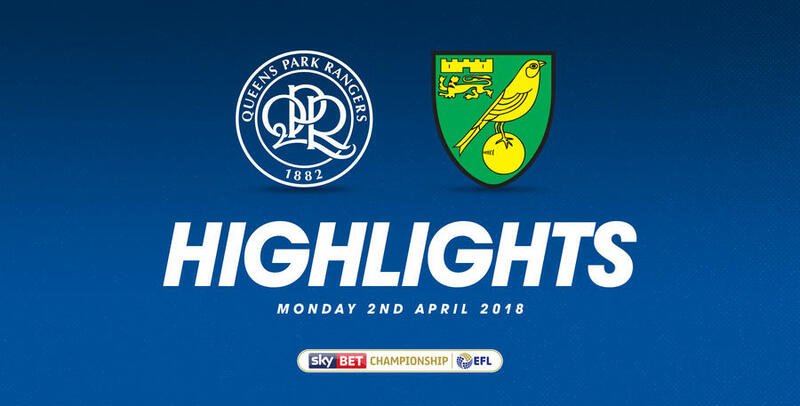 A positive end to the first period for the R’s – and things got even better when Holloway’s charges took a 55th-minute lead after the interval. Just like the two before it, it was another unorthodox goal that led to QPR hitting the front. Scowen’s edge-of-the-box blast deflected up into the air off Smith – before that same man got the better of ‘keeper Gunn in an ensuing aerial tussle to head home from all of two-yards out! Lift-off at Loftus Road – and a confident Rangers side extended their lead to two goals on the hour mark. It was a direct but ultimately-effective move that saw the R’s go 3-1 up, as Smith headed down Scowen’s lovely diagonal pass into the direction of Eze. The skilful youngster then took a touch before sliding home beyond Gunn from eight yards. Rangers were now playing with a swagger. 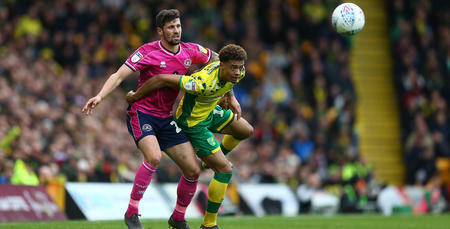 Norwich, though, should have reduced the deficit on 70 minutes – Oliveira spurning a good opportunity by dragging wide from 10 yards, albeit on the angle. Holloway made a first QPR change in the 78th minute. Idrissa Sylla replaced Smith, who received a standing ovation for his impressive battering-ram performance. The R’s almost had a fourth almost immediately after, as Freeman’s free-kick effort flew just past the foot of the left-hand post. But goal number four would arrive 10 minutes from time, with Rangers rounding off what in the end was a dominant home performance. Bidwell’s ball from the left was to a tee - Manning ghosting in front of his marker in the box to head beyond Gunn. Four-one to the Super Hoops. 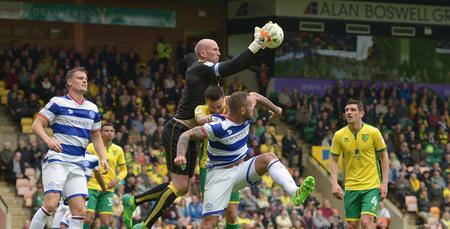 WATCH highlights from QPR's 4-1 win against Norwich City at Loftus Road.